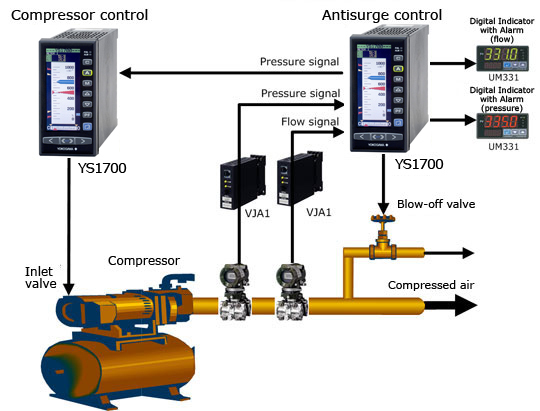 In such cases, the YS1700 Single-loop Controller switches smoothly and automatically between flow control and pressure control to prevent surging. * A compressor is an important device in every kind of factory that is used to compress air, oxygen, hydrogen, and other source gases and process gases. Allows for automatic switching between two differing control factors, flow volume and pressure. Keeps up with fast process changes, enables smooth switching control. Enables start-stop sequences and can be customized in various ways for compressors.